Sony Pictures Animation has released the first trailer for Hotel Transylvania 3: Summer Vacation, along with a new poster and photo from this animated sequel. Unlike the first two movies, this sequel isn't really set at the actual Hotel Transylvania, with Drac and his family and monster friends setting sail on a cruise. This trailer comes a few months after fans got to see the Hotel Transylvania short film entitled Puppy, which was attached to prints of Sony's The Emoji Movie. 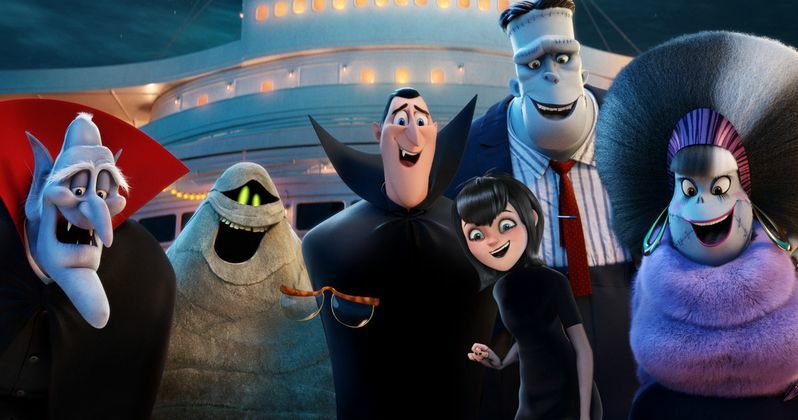 In Sony Pictures Animation's Hotel Transylvania 3: Summer Vacation, Mavis surprises Dracula with a family voyage on a luxury monster cruise ship so he can take a summer vacation from providing everyone else's vacation at the hotel, and the rest of Drac's Pack cannot resist tagging along. It's smooth sailing for Drac's Pack as the monsters are all having a great time, indulging in all of the shipboard fun the cruise has to offer, from monster volleyball to colossus sized buffets and exotic excursions, but then the unexpected happens as Drac falls for the intriguing-yet-dangerous captain of the ship, Ericka, who hides a dangerous secret that could destroy all of monsterkind. The cast includes all of your returning favorites from the first two movies, including Adam Sandler (Dracula), Andy Samberg (Johnny), Selena Gomez (Mavis), Kevin James (Frank), Fran Drescher (Eunice), Steve Buscemi (Wayne), Molly Shannon (Wanda), David Spade (Griffin), Keegan-Michael Key (Murray) and Mel Brooks (Vlad). There was originally talk that director Genndy Tartakovsky would not be back at the helm, but he did in fact return to this beloved animated franchise, directing from a script he co-wrote with Michael McCullers. The director also lends his voice to a character known as Blobby. Sony Pictures Animation had originally set a fall release date for this animated sequel on September 21, 2018, which falls in line with the mid-September release dates of the first two movies. But considering that this sequel takes place during a summer vacation, the release was shifted to July 13, 2018, where it will go up against New Line Cinema's The Nun, another spin-off of the studio's lucrative The Conjuring franchise, and Universal's Skyscraper, starring Dwayne Johnson. It will be interesting to see how an animated comedy with horror roots will fare against an actual horror movie like The Nun. While Hotel Transylvania 3 seems to be going up against some heavy competition, it may still be in better shape than if it would have been released on September 21, 2018. Universal will release The House With the Clock In Its Walls on that date along with Lionsgate's long-awaited Robin Hood, with Sony using this date for their Goosebumps 2 sequel instead of Hotel Transylvania 3. This animated sequel was also showcased during Sony Pictures' CinemaCon 2016 presentation, although the studio hasn't revealed the full title and story line until now. Along with the domestic trailer, poster and new photo, Sony has also released an international trailer, courtesy of Sony Pictures YouTube, which you can check out below.